Last Friday our whole lives seemed to be taken over by A Series of Unfortunate Events coming to Netflix. I feel like we’ve been waiting for this adaptation for so long it still doesn’t feel real that it’s right there for our viewing pleasure. 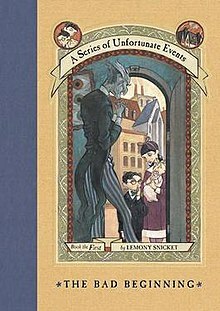 If you’re not aware of what i’m talking about, A Series Of Unfortunate Events by Lemony Snicket has been adapted in to a television series staring the likes of Neil Patrick Harris and Patrick Warburton. Unlike the movie, the eight part series will feature the first four novels in the series (The Bad Beginning, The Reptile Room, The Wide Window and The Miserable Mill) at two episodes per story. And if you’re really unaware of what the story is about, it is centered around the three Baudelaire children, Violent, Klaus and Sunny. When they become orphans, they are forced in to the life of Count Olaf, a family member who then tries to steal their fortune. The story generally unravels from there as they constantly move from carer to carer, trying to escape their rapidly changing, dis-satisfactory life. When i started the first episode, i had no idea what to expect to be honest. I hadn’t seen any spoilers and specifically chose not to find out anything about the characters, set up of the show or actors. I was overjoyed to discover that they were using a narrator and the novel as a screenplay. I was expecting more so of a loose adaptation that didn’t follow the exact story-line (considering it technically already has been adapted to screen) but that’s not what happened at all. The story is kept to the book completely, and this already makes for a wonderful adaptation to me. The best thing about the series for me is the eerie feel that it gives off in some of the scenes. It already feels a lot more grown-up than the movie adaption and obviously the books are. It’s not necessarily scary, but much more adult and spooky. The scenes and settings themselves are stunning, and it’s exactly how i pictured this story to be. A highlight is definitely the humour in the story this time around. Neil Patrick Harris creates a wonderfully funny Count Olaf, making much more of a joke out of the character than i imagined possible. It’s my kind of humour and i’m loving that about this series so far. I have very few little niggly bits that i don’t like about it. Somethings aren’t overly consistent, and some aren’t necessary, however the acting is brilliant, the sets, atmosphere, story is brilliant. I really am enjoying it so far. I’m only half way through, hopefully i can get it finished within the next few days. I’m excited to see how this story plays out on screen and how the first series is wrapped up. I think i’m going to have to read the books once again to get over the loss of it in my life once the series is over.